The massive Las Vegas Bonhams motorcycle auction took place on Thursday, January 24 with 128 motorbikes going under the hammer. Among a crowd of famous and rare machines, Steve McQueen’s Triumph arguably stole the show, nearly doubling its high estimate. The 1938 500cc 5T Speed Twin, which incidentally gave its name to the 2019 Triumph Speed Twin, sold for £118,278 on a high estimate of £65,000 due to its excellent provenance. While McQueen was always known as a fan of the brand, there are very few Triumphs still left that the film star actually rode. This particular model has changed hands a few times since it was sold at the original McQueen estate auction in 1984. Despite its age it’s in excellent condition because McQueen had his friend, mechanic and Great Escape fence jumper, Bud Ekins do a complete restoration on the bike in the mid-1970s. In fact, Ekin’s decal remains on the bike to this day. It’s even believed legendary pinstriper Von Dutch did the coach lining on the bike but sadly there’s no documented proof. One of our personal favourite bikes, the Ducati Supermono (above) also did well. 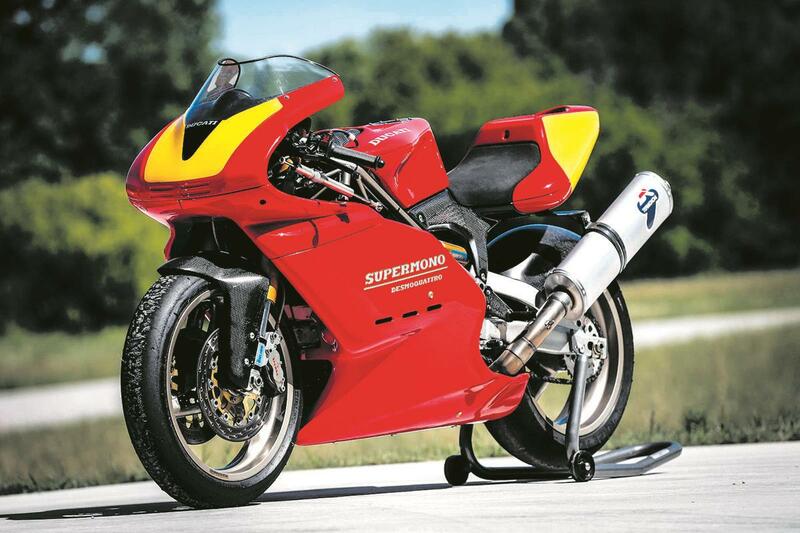 If you’re not familiar with it, the Supermono is a lightweight race bike, built for a specialist single cylinder race series. Famous for its radical styling, said to inspire the 916, the bike was a technical marvel with the chassis even designed by Ducati’s CEO Claudio Domenicali. Only 65 of the TT winning thumpers were ever made, which goes some way to explaining why it sold for £76,308 – double the amount a Desmosedici sold for earlier on in the auction. Though if you’re one who kicks themselves on missing a bargain, you’d best stop reading now. For a start two gorgeous mid-80s Mike Hailwood replica Ducatis sold under estimate at just £10,301 and £8775, while a completely original and unrestored 1916 Harley-Davidson 16F slipped out the door for just £22,892 – a third of the low estimate. The biggest upset, or win for the lucky bidders, was a huge collection of desert racers went for peanuts including a 650cc Rickman Metisse that went for £2632 and a 1967 TT Special for just £5440, a bike that would usually fetch north of £15,000. Anyone want to lend us a time machine?